When I downgraded to a 900 sq ft. apartment from a 4 bedroom house, Craigslist became my best friend. After 2 years of slowly getting rid of my clutter, I realized how much I learned about marketing along the way. Here are four lessons to help you with Craigslist selling and inbound marketing! They don’t read or read well. Short sentences. Or just bullets. Sometimes even pictures can confuse them. They are paranoid – have been burned in the past or are expecting to meet a serial killer. Include detail on the condition of the item and a map with your general vicinity so you can be perceived as an honest individual. They both love a bargain and to bargain. Start at a fair price but always list “OBO” (or best offer). They are of the mindset that they are doing you a favor by taking X, Y or Z off your hands. Be clear on how they should contact you. Every experience on Craigslist is a little different, but by considering your average user you can focus on ads that WORK! Same can be said for inbound marketing. Not every blog, advanced content or email campaign will be for your top persona. But the majority of content should be written with your persona in mind. 2. A good title goes a long way. With inbound marketing, your content is everything so the title is important to not get lost in the crowd. Thankfully you have tools to see common search terms so make your titles smarter. Test new titles and consider what questions your customers are asking. 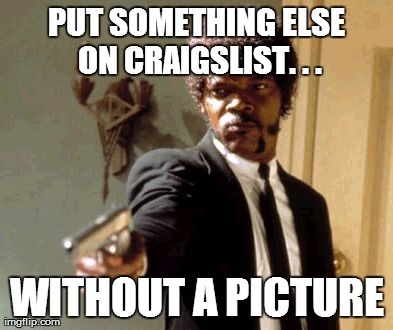 Dark, cluttered or no photographs of items for sale on Craigslist rarely works. I always post a couple photographs with various lighting so it’s clear I’m being honest about the item I’m selling. Nothing kills credibility faster than a stock photo that’s impersonal and generic. 4. Lead follow-up and the close. Craigslist users are flaky and drop off the face of the earth 50% of the time. The right follow-up email that makes the deal more urgent or offers an incentive can go a long way. If you aren’t following up with your leads in a meaningful way, you are missing out. Once you understand your typical buying cycle, address their common fears then offer a timely deal. Test and re-test your lead nurturing campaigns. Do you need help making your inbound marketing work? We’re happy to help. Contact us here.